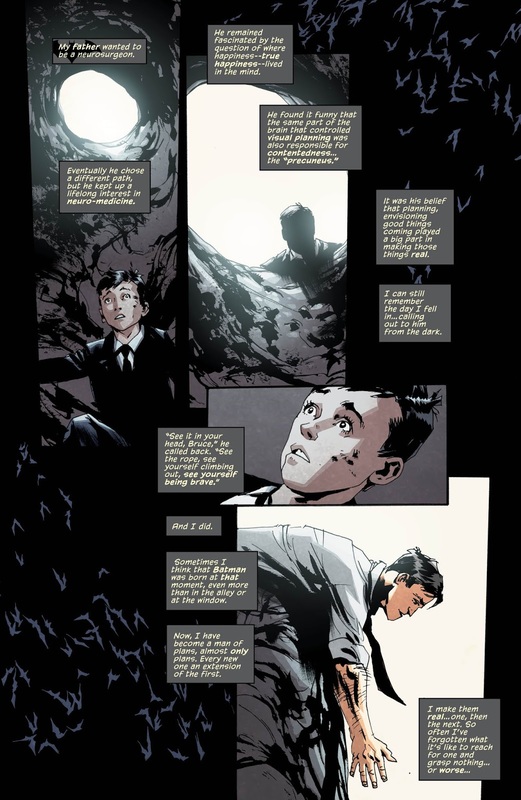 We open with a bit more young Bruce flashbacks that Snyder has used to frame his issues. 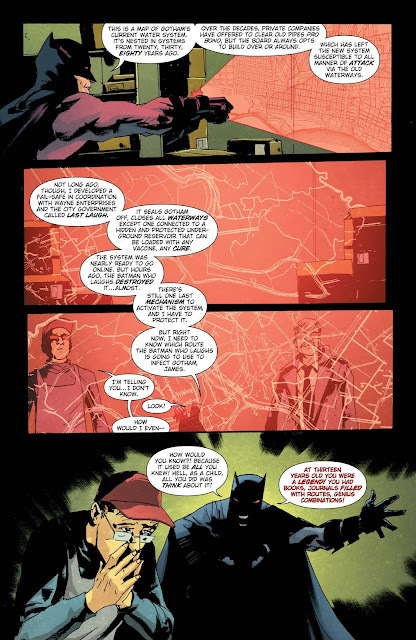 This neuro-medicine is more of a foreshadowing on the program that James Gordon Jr. is involved with and the art and tone of the first few pages had me geared up for the issue. However, when we go to Gordon and his son, I was taken out of it a bit. The idea that there would be any sort of program to allow James Jr. to get out of jail is crazy...crazy enough not to work and crazy enough to get a ton of people killed. Sure, we are dealing with Gotham and it's revolving door prison system, but a lot of that works by just ignoring it. There might be a little too much information here as Snyder tries to convince the reader why this could happen and in the end, I don't think it could happen. All that aside, I love having James Jr. involved in this story so I can put most of my qualms aside for it. Most of them. Batman shows up and really, his plan is simple...use Jr. to figure out what the Batman Who Laughs is planning to do. It's the old "use a psycho to catch a psycho" plan that worked for Clarice Starling, but Batman has a bit of a problem here...his Hannibal Lecter is not a psycho anymore. While Batman struggles (and punches) with that throughout the issue, the Grim Knight shows up as a wild card and grabs the elder Gordon and the why for it is a game changer...or ender. 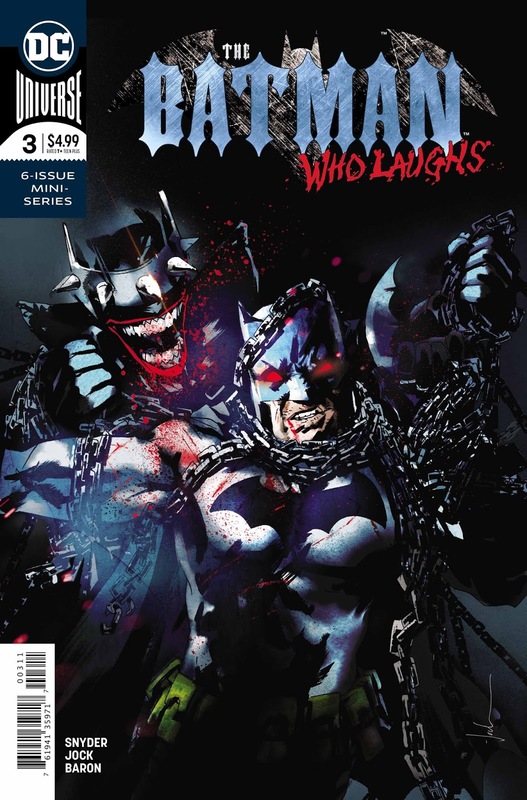 We do get some Batman Who Laughs who shows Penguin who is boss in town now and even ruins one of the best things about Batman for me. RIP Matches! 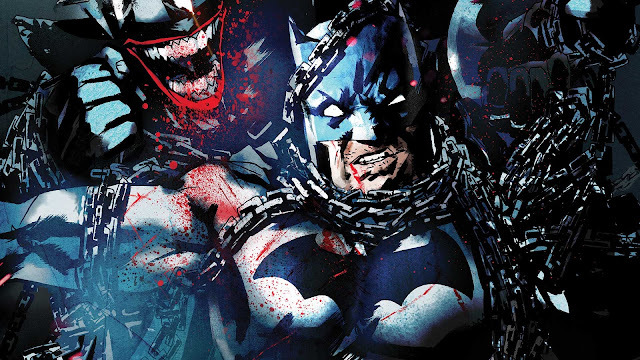 The issue ends with Batman at the end of his rope (pun intended!) and takes the "desperate times" adage to the extreme. He may be right, though, but I would save the costume changes for Lady Gaga next time. Actually, it makes for a pretty awesome cliffhanger. This is a setup issue and I thought the pacing suffered, especially with the over-explanation of the Jim Jr. situation. It doesn't ruin the issue by any stretch, but this one was my least favorite so far. Still good, but still least favorite. I will surely end up sounding like a broken record before this is all said and done, but Jock's art fits this series so well and it's easy to see why he is Snyder's go-to guy with this style of book. This issue looks great. This issue suffers a bit in the pacing department as Scott Snyder pauses a bit to make things fit a little bit better. I am still on board and the cliffhanger has me pumped for the next issue. Jock's art was great, but overall this issue was just good.